Forearm exercises can help strengthen your forearms and prevent injury. Every golfer knows that the use and strength of the forearm is important to the game of golf. When the forearm is strained from overuse you can develop Golfer’s Elbow. This type of pain is caused by having your arms fixed in an awkward position, constant repetition and excessive force. Stop stop forearm pain by using proper form when playing and performing simple forearm exercises before you play. Exercising will help to strengthen your forearms so that you can prevent any possible soreness from occurring. Perform lifts and hang from a bar. This is a strengthening activity that is best to do as pre-warm up activity before you go golfing. Consider going to a gym before playing or use your own chin-up bar. Build forearm strength by simply performing a routine where you let yourself hang for two- to five-minute periods. Do at least four sets of this routine. Pull yourself into a chin-up on the bar after hanging. Lift your chest up using your forearm strength. Stop once your chin reaches over the bar. Do four sets of five lifts until your forearm strength increases. Use a dumbbell to add more weight to the process of strengthening. You should use weight that will allow to push yourself and perform three sets of eight to 10 repetitions. Decrease the weight if you are struggling to do eight reps. Perform forearm curls using the dumbbell. In seated position, pick up the dumbbell. 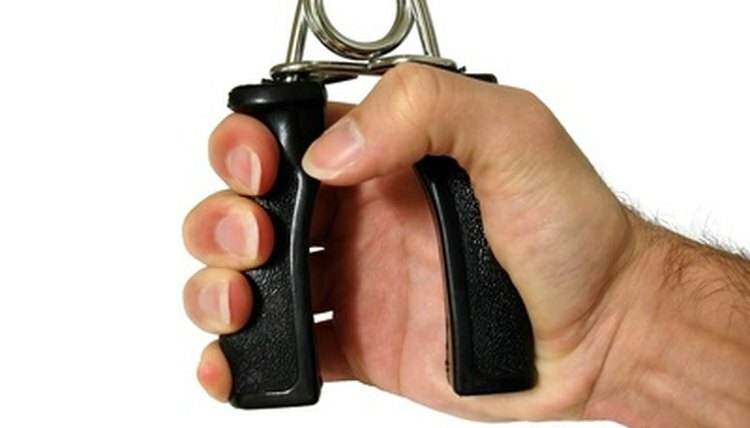 Let the bar of the dumbbell roll down to your fingertips and then swiftly bring it back up to your palms. Only do this exercise for a minute and then build up to five minutes. Try simple warm-up exercises before you begin your golf game. This includes doing at least 20 toe touches and push-ups. Also, touch your hand to your upper back just below your neck and apply pressure to your elbow using your other hand. Perform this exercise for both arms for 20 seconds.